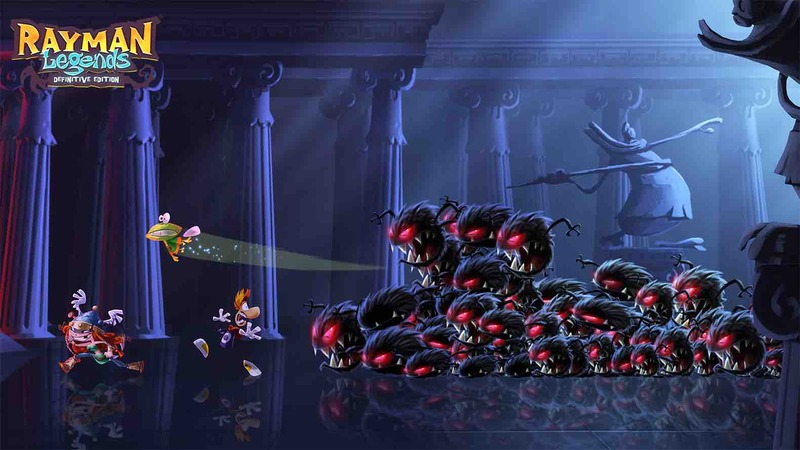 Rayman Legends feels like one of those games that’s appeared on just about every modern system you can think of. From the Wii U and PlayStation 3 to the Xbox One and PC and even a handheld entry in between for good measure. Now it has finally, and rather unsurprisingly, made its way onto Nintendo Switch with what is being labelled the Definitive Edition of our armless hero’s adventure. Is Ubisoft’s platforming classic worth another revisit though? 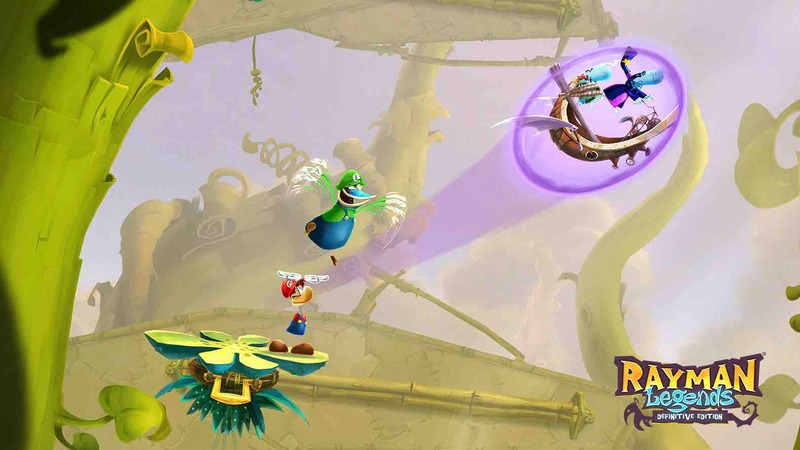 Rayman Legends: Definitive Edition is your classic 2D platforming affair. You’ll take the limbless hero through a series of colourful stages running, leaping, wall-jumping, punching and doing just about every platforming action you can think of along the way. Every world – be it a fairytale castle, secret base under the sea or giant beanstalk in the sky – bring with them obstacles to triumph, secret rooms to discover and bosses to defeat. Put quite simply Rayman Legends: Definitive Edition is the genre running on all cylinders; the movement of the characters so fluid and perfect, level design inventive and always surprising and a visual style that elevates it beyond more generic efforts like the New Super Mario Bros. series. Just when you think you’ve seen it all, Rayman Legends: Definitive Edition steps things up a notch and this constantly happens throughout your ten plus hour journey. Levels are accessed through the game’s hub area, a series of rooms each with paintings to hop into not too unlike Super Mario 64. 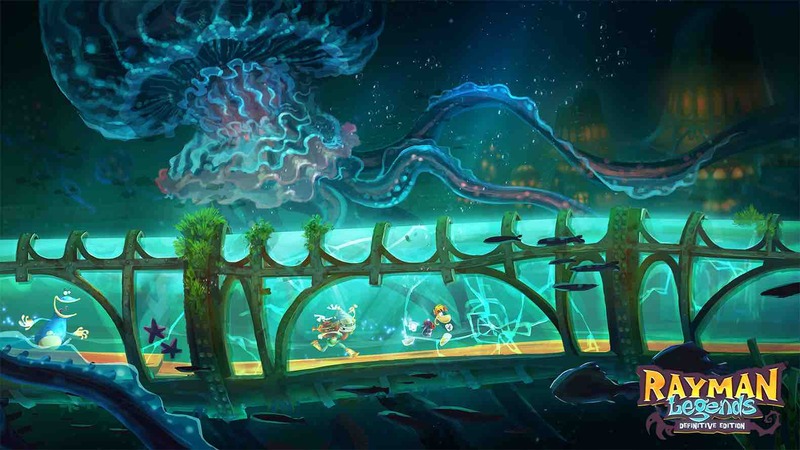 While most platformers will simply have you trying to make it through one of these levels in one piece, in Rayman Legends: Definitive Edition this is just half the battle. Not only are collectable lums used as a means to judge your overall performance but every stage also houses up to ten trapped Teensies that must be located and freed with the quick punch of your fist. Collecting and finding these goodies means more unlockables be it in the form of new characters, levels both new and from the previous title Rayman Origins, scratch cards or cute monsters that in turn offer more lums when you visit them. Why? Well, why not? Then there are the musical stages – almost endless runner in style that will see you jumping or punching in time with famous tunes like Black Betty or Eye of the Tiger. Again, they’re so unique and fun and easily one of the game’s highest points, it’s just a shame there aren’t more of them included overall. Boss battles also radiate the same level of imagination pitting you against a giant wrestling Luchador one minute and then coming face to face with a flying medieval dragon the next. While the entire adventure can be played as a single player experience, the game also sports some great multiplayer too with up to four people able to tackle every 2D obstacle course using just a single Joy-Con. As you can imagine, the more players added to the mix, the more chaotic the action becomes. Nonetheless, thanks to an absence of lives and fairly lenient checkpoints, countless deaths never feel frustrating enough to anger. And that’s one of Rayman Legends: Definitive Edition‘s greatest strengths in that no matter how many times you might find yourself plummeting down a pit or on the receiving end of a wooden club you want to jump back in right away and try until you succeed. Performance wise the game runs just as well as its previous versions with rarely a frame dropped. Playing in Handheld Mode is especially impressive, with the game looking fantastic on the smaller screen. In that regard, Rayman Legends: Definitive Edition feels like a game made for taking on the go. Murphy specific stages are also included which back on the Wii U allowed for one player to manipulate the environment using the said character (be it moving platforms, distracting enemies or hitting switches) using the Wii U GamePad’s touchscreen while the rest would play as normal. It was such an inventive feature at the time and one that added a real sense of teamwork to the mix. In the Nintendo Switch version, however, these stages are restricted to a single person. Murphy’s abilities are now either relegated to a simple button press or with a computer traversing and yourself operating switches and the like using the touchscreen in undocked mode. It’s a real shame as what made these moments so special was the sense of bedlam and comradery to come from working as a team. Now, these Murphy specific stages lack the same level of fun and at times feel slow and tedious. Daily and weekly challenges offer players the chance to show off their platforming skills to others in the country be it in timed, collection or distance based competitions. These trials are perfect for those with only a few minutes to spare and will constantly have you coming back to try and upgrade your efforts to a higher trophy level. Kung Foot is perhaps the only area of the game to see any actual addition. This comes in the form of a new tournament mode where up to eight teams can battle it out in a knock-out style competition. While playing simple football matches using the game’s platforming mechanics is goofy fun, this extra option feels rather pointless and like something that wasn’t exactly necessary. How often are you going to have eight teams of players together for some Kung Foot? Which brings me onto perhaps the game’s biggest fault – what exactly about this feels definitive? A few Ubisoft related outfits, portability and a tournament mode do not feel enough to justify the label or added price. Had the developer thrown in some new worlds or even just a handful more musical stages this would at least have helped in justifying a repurchase from fans of the series. Throw in the fact that the Murphy levels are restricted to a fairly lifeless single player experience and if anything you could argue the original Wii U version actually still has the edge. Rayman Legends: Definitive Edition is a tough game to review. On the one hand, it’s still a fantastically creative platformer with plenty of content to offer and an easy recommendation for anyone yet to experience this adventure. On the other, though it’s yet another version of a game we’ve seen plenty of times already with little to offer returning players especially at its higher price point. While my final score reflects the game’s general quality if this isn’t your first visit to the Glade of Dreams I’d argue your money might be better off spent checking out new, unexplored territory on the Switch.